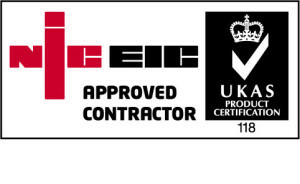 If you’re looking for professional and reliable commercial electrical services then make sure you use an NICEIC approved electrical contractor, Project Skills Solutions are proud to have been an NICEIC Approved Electrical contractor since 2009 we believe this leading external verification shows our clients that they can expect the highest quality electrical services when working with us. For over 50 years the NICEIC UK’s leading voluntary regulatory body has been assessing the competence of electricians and electrical contractors, the NICEIC regularly check and monitor approved contractors and their work. Approved electrical contractors undergo a rigorous assessment process, covering a representative sample of their work, their premises, documentation, equipment, and the competence of their key supervisory staff. They are then re-assessed on a regular basis to ensure continued compliance. Once registered with the NICEIC, electrical contractors can access a range of support services, including technical advice, industry recognised training, industry literature and contractor insurance. Stay safe and use an NICEIC electrical contractor. Regular assessments ensure quality service and safe practice from contractors. If you have any problems with your contractor who can you complain to? Well if they are NICEIC approved any work you are not happy with will be put right, guaranteed.